I've always been a sucker for falling for and purchasing products with stunning packaging, even if they haven't necessarily had the best reviews in the past. Here I have done exactly the opposite. I had been wanting to try a body exfoliator for a while and after doing a bit of research I came across 'Palmer's' which many beauty bloggers seemed to be raving about. Although I was put off by the unattractive and somewhat sinister looking packaging (basically if it's got a lot of writing on it, it's not for me) I decided to purchase it anyway, along with a moisturiser which was on sale, and give it a go! I have to say that I'm incredibly happy I gave it a chance. The body scrubs I had been previously using ranged from £15 to £25 - not exactly in my budget right now. At £3.29 from Superdrug this product is everything I needed to exfoliate my skin. I tend to have a very negative mind-set when it comes to beauty products and money. I usually automatically think that if it costs less it wont be as good, which is not always accurate. In this case, it's definitely not! I'm currently loving this body scrub and am using it every single day. It's been just over two weeks and I have definitely recognised a noticeable difference in the condition of my skin. Although the look of it has not changed (not that I really wanted or needed it to anyway) I can still tell that my skin has become much softer since using it. Adding the moisturiser after exfoliation has also helped as well. It soaks right into the skin and leaves it smelling lovely and feeling nice and conditioned. In total, I only spent £6.29 on these two products which is a complete bargain. However, it would only be right for me to mention the negatives as well as the positives. Sadly, the cocoa smell is not very prominent and what you can smell does not last on the skin more than an hour or so. I usually have to apply my Ted Baker body lotion over the top of the moisturiser to create a scent that lasts much longer. The body scrub also is used up very quickly. As I said, I've been using it for two weeks and am already a bit over half way through, although at £3.29 I'm not exactly complaining! Despite these negatives, I would definitely re-purchase these products. Have you tried these products before? Let me know what you think! 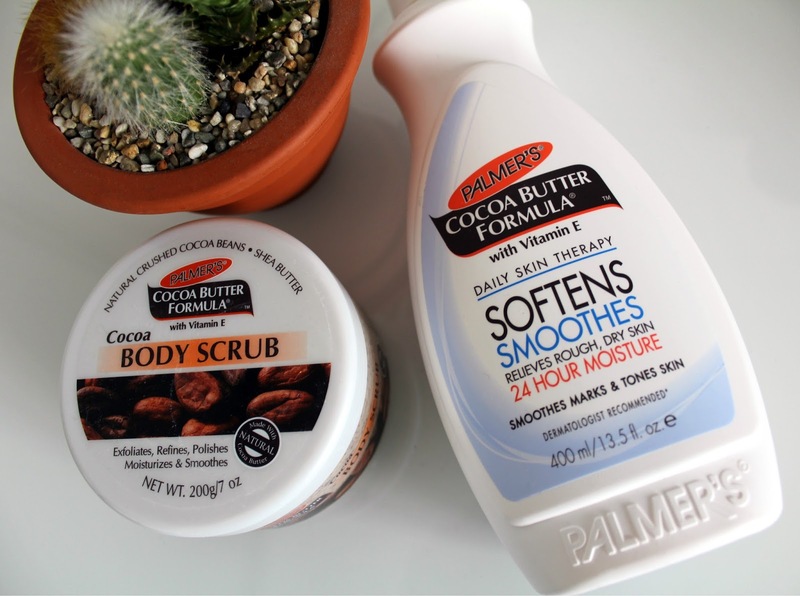 I must say all the Palmers products have a really awesome scent and are quite nourishing. Is this edible as well? "Sinister packaging" haha I love it! I'm the same though, I want things to look nice, but sometimes I just can't get over how expensive packaging can make the products! Hopefully this is in the US as well. I never heard about these products. Should try it out. I haven't actually tried this. It sounds like a good product. What a wonderful and honest review.